We just received and installed Snow Leopoard. The new OS X 10.6 arrived on time hassle free and installed easily aswell. PCWizKid has been using Windows 7 since Beta build 7000. Its time now for a series of video reviews that show what it has to offer. What’s it got you dont already have? Watch Part 2. It covers the “missing” Windows 7 Essentials and how to get them free. PCWizKid is a a big fan of the 3G smart-phones of today. One thing you want to remember is that your smart-phone will use more power than a simple phone due to its large screen display and capabilities which add to the power consumption requirements. Having a extended battery is a must if your using your iPhone 3G to the fullest. Another aspect to remember are scratches. You want to protect your iPhone 3G from unnecessary scratches. Today PCWizKid has the opportunity to review the iConn case and battery from Wellcomm Inc, the model iBP1200. Basically it is a stylish protective case with a battery to give your iPhone 3G both the security and piece of mind that you wont run out of battery. While iPhone is connected to iConn+, it will be charged at the same time through your laptop or PC simply by connecting it with the mini USB cable. This functionality makes it convenient for users, since they won’t have to charge them separately. Visit www.iconnectedyou.com to order the iConn case with battery. The iConn+ delivers the extra power to keep your iPhone 3G going and protected with a stylish case. The combination of features and support for the iPhone 3G makes this a great addition to this smart-phone and extends the iPhone battery with less frequent charges. PCWizKid has been eagerly awaiting the new AM3’s for while now. The anticipation of how AMD was planning to answer back to Intel with a cost effective approach is not only smart but well received since we are going through tough economic times. Not too long ago we reviewed the Phenom X4 9950, today we review an upgraded architecture using the AM3 938 pin socket. 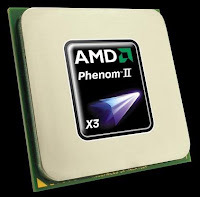 This Tripple core, black edition we have is the Phenom II X3 720. The model for your reference is HDZ720WFK3DGI . Building a Gaming Rig can be a challenge if your not sure what to get for the games you plan to play. There are several ways at approaching building your power house PC, you can work within a budget and stay within your limits, you can build according to the preferred system configuration the manufacturer of the games you play suggest or you can go by category from Mainstream to Extreme Gaming Rig configurations and decide from there. To makes things easy for you, PCWizKid has put together 3 system configurations to meet each budget and category. The bottom line is you want the be able to do overclocking and getting application and games performance beyond the standard PC, so all these 3 configurations will give you that. Click here to visit PCWizKid’s NEW Official Website that has the full article. Also for a individual recommended parts list PCWizKid has categorized components. Microsoft released it’s public beta of the newest operating system in it’s lineup, Windows 7 Beta 1. But before you go ahead downloading it you might want to check a few things first. The Beta will stop working on August 1, 2009. To continue using your PC, please be prepared to reinstall a prior version of Windows or a subsequent release of Windows 7 before the expiration date. You won’t be able to upgrade from the Beta to the final retail version of Windows 7. 1 GHz 32-bit or 64-bit CPU with a minimum of 1 GB of system memory. You will need 16 GB of available disk space to install Windows 7. A DirectX 9 or 10 graphics card with 128 MB memory (to enable Aero) and a DVD-R/W Drive. dont forget you will need to have internet access afterwards to download the latest updates for it. Once you have verified you are capable of running it, go here to download the beta which is available in 2 flavours the 32 or 64 bit . If you have 4GB of RAM or higher it is recommended to use the 64 bit version so you can utilize the memory to the fullest. After submitting a Live ID and answers to informational questions from Microsoft, you’ll be taken to a download page with a product key. Direct download links to the ISO 32-bit image file or 64-bit image file. If you are new to installing a beta , it is recommended that you have your drive partitioned first if you are going to dual boot with a previous OS like windows XP on the same PC and make windows 7 your secondary OS. If your only installing Windows 7 stand alone then it will be your primary OS and you dont really need to partition your drive. A free utility I have used in Ubuntu Linux which works with Windows OS’s also is the GParted Live CD, which you burn to a CD, restart, boot from it and partition your drive preparing it before you install windows 7. The easiest way to install Windows 7 on your system is to download the image file make a disc by burning the image to a DVD. The Windows 7 Beta download is an ISO file, which you’ll need to burn onto a blank disc before you can install it. To do that, you’ll need to use software designed for burning ISO files. In addition to commercial ISO burning software, there are free programs such as ISOBuster. I use Nero Burning software. Boot from the DVD you made of Windows 7 and follow the setup wizard. You can also upgrade from Vista SP1 to Windows 7 Beta 1 if you dont mind the change. I prefer doing a clean install always of an OS and if you dont want to lose your existing OS then add a separate partition and install the new OS on a separate area of your hard drive. Once the installation is completed, review the state of the Windows 7 installation by testing your hardware and getting the latest updates to help ensure a successful installation and protect your computer against security threats.